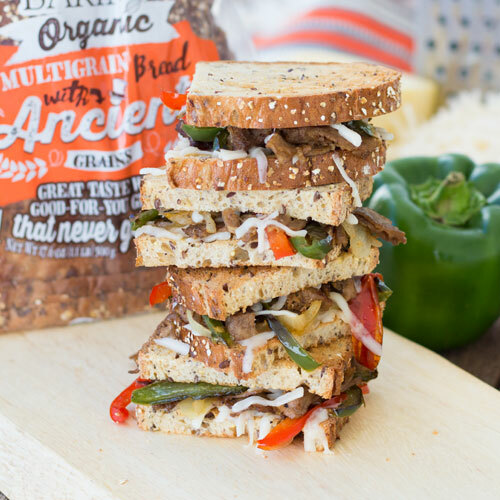 Fabulous, full-of-flavor Philly Cheesesteak now comes in a convenient grilled cheese format. Don’t be put off by the inches-high sandwich pictured here, our photographer was terribly hungry on the day of the shoot. Anything made with Grace® Baking Organic Multigrain With Ancient Grains tends to have that effect on people, and more so if they’re making anything as tempting & decadent as this. Rest assured, you’re allowed to eat it in small bite sizes. The Philly Cheesesteak is a wonder of gastronomical savvy, and a tradition sure to last forever. Who are we kidding… it’ll last 5-6 minutes tops on any plate, 3 if you’re feeding teenagers, under a minute if they manage to put down their smartphones. Heat olive oil in a medium skillet over medium heat. Add onions and cook until soft (approximately 5 minutes). Add bell peppers and cook for approximately 2 more minutes. Transfer mixture to a bowl and return skillet to stovetop. Season steak with salt and pepper, and cook in hot skillet to desired doneness. Spread butter on one side of each bread slice. Place two slices, butter side down, in a large skillet over medium heat. Layer on half of the cheese, steak, peppers and remaining cheese. Cap with the remaining slices of bread, butter side up. Cook sandwiches, flipping intermittently, until cheese is melted and bread is golden brown on both sides (approximately 3-5 minutes).